Woodbury, New York – August 30, 2017. This week at Caravan Salon in Dusseldorf, Germany, premium recreational vehicle supplier Lippert Components, and Knaus, a leading manufacturer of leisure vehicles in Europe, are both featuring the world premiere of dimmable windows using Research Frontiers (Nasdaq: REFR) SPD-SmartGlass technology. These electronically dimmable smart windows, which dramatically improve the recreational vehicle passenger experience, were supplied by Vision Systems, a licensee of Research Frontiers. Vision Systems’ smart windows using SPD-SmartGlass technology deliver unprecedented benefits for passengers in recreational vehicles of all types. By enabling users to precisely control the amount of daylight and glare coming through windows, passengers can touch a button and instantly tune the tint to a comfortable level while continuing to enjoy views, rather than blocking their view with a shade. These smart windows can be controlled directly by the passengers, through a centralized control panel, or automatically with integrated light sensors. The system delivers many other benefits including a cooler interior due to remarkable thermal insulation properties, and a quieter interior due to acoustic insulation properties. This week in Dusseldorf, visitors are able to experience Vision Systems’ Nuance V2, their second generation of SPD-Smart EDWs. According to Vision Systems, Nuance V2 provides superior optical quality, with clarity close to 100% and haze less than 3%. For more information about Vision Systems solutions at Caravan Salon 2017, we invite you to read the Vision Systems press release. Knaus is a leading manufacturer of motorhomes, caravans (trailers) and camper vans in Europe. The company achieved sales greater than 410 million euros in fiscal year 2016. With over 1,500 employees, the company manufactured 16,366 caravans and motorhomes in 2016. The world premiere of a floor-to-ceiling panoramic SPD-Smart Nuance V2 EDW, supplied by Vision Systems, is being featured on a full caravan at Caravan Salon 2017. Lippert Components is a world-leading supplier of premium components including to the recreational vehicle industry, with 52 manufacturing and distribution facilities located throughout the United States, Canada and Italy. Lippert supplies a broad array of components for the leading original equipment manufacturers of vehicles including recreational vehicles, buses, trucks, and trains. At Caravan Salon 2017, visitors can experience a large SPD-SmartGlass dimmable window demonstrator supplied by Vision Systems. 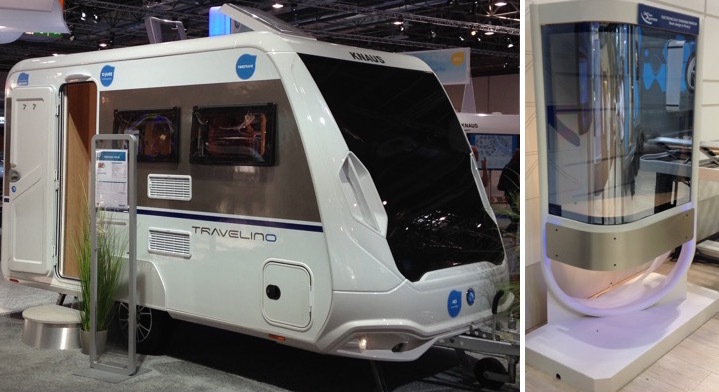 Vision Systems electronically dimmable windows, using Research Frontiers’ SPD-SmartGlass technology, on (at left) a Knaus caravan, and a Lippert Components demonstrator (at right). In addition to controlling the level of light and glare coming into a recreational vehicle, SPD-SmartGlass windows offer other advantages. This technology provides unsurpassed thermal insulation – substantially rejecting solar heat from entering RVs through windows. When compared to conventional automotive glass, Mercedes-Benz reported that the use of SPD-SmartGlass significantly reduced the temperature inside the vehicle by up to 18 degrees F (10 degrees C). This increases passenger comfort and reduces air conditioning loads, saving fuel and reducing CO2 emissions. SPD-SmartGlass delivers other benefits to the living space in an RV, including acoustic insulation, elimination of blinds or pleated shades (reduced cleaning, rattling of shades and a general reduction in interior noise) and keeping an unoccupied RV cooler. The SPD-SmartGlass achieves its maximum heat-rejection state when the RV is parked/turned off and no power is consumed. Note: From time to time Research Frontiers may issue forward-looking statements which involve risks and uncertainties. This press release contains forward-looking statements. Actual results could differ and are not guaranteed. Any forward-looking statements should be considered accordingly. “SPD-SmartGlass” and “SPD-Smart” are trademarks of Research Frontiers Inc. “Nuance V2” is a trademark of Vision Systems.